What does a welcoming entrance look like? 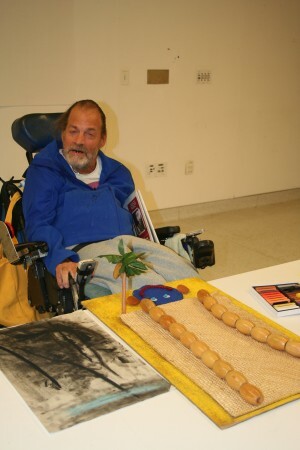 How do people in wheelchairs maneuver around the Sculpture Garden or the galleries? Can other sensory elements like smell and touch be part of a space where art is viewed and experienced? These are some of the questions asked by 12 artists from Partnership Resources, Inc. (PRI). In September and October 2012, these artists and I probed the Walker’s public spaces, galleries, and art lab. Our quest was to experience, respond to, and design two unique spaces for art ── one outdoor and one indoor. After visiting the Minneapolis Sculpture Garden, the PRI artists shared opinions about particular sculptures and the Garden’s overall design. Lara Hanson, artist-in-residence at PRI, collected the artists’ written feedback. 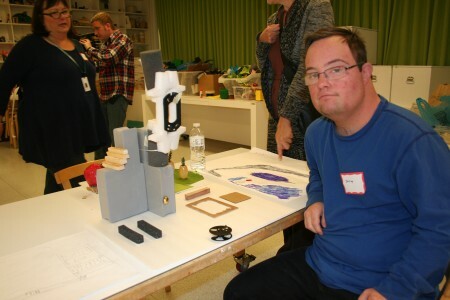 Questions of accessibility were addressed and the artists had some comments. “the little ridges of metal around each of the four square plots were an issue ──chairs could probably get over them, but Andy and Richard didn’t want to try. Mud and deep edging along the sidewalks (was a concern).” This insightful critique aided artists in designing their projects. 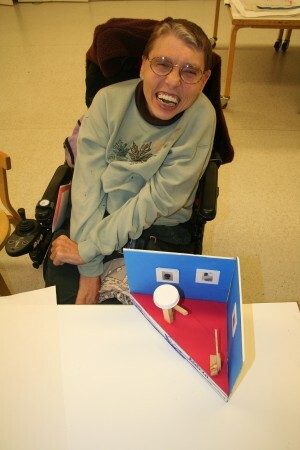 To articulate their preferences, the artists sketched out site plans and built models of their outdoor spaces. Henry Moore’s Reclining Mother and Child inspired Tammy’s observation that motherhood has its smooth and rough times. 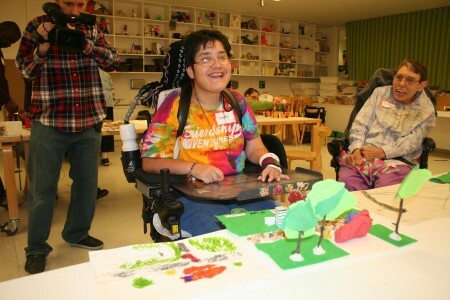 An elevator from the parking garage would carry people, with or without wheelchairs, to Zach’s sculpture garden on the top level. When it came to exploring the indoor spaces at the Walker, each artist documented their experience with a point-and-shoot camera and completed a feedback sheet. They responded to spaces including the Garden Cafe, Cargill Lounge, and a whirlwind tour of artworks in galleries 1, 3, 4, and 6. With our corps of volunteer tour guides and PRI staff, we had an exceptional experience. Everyone was able to flow at their own pace, and we had the galleries to ourselves. 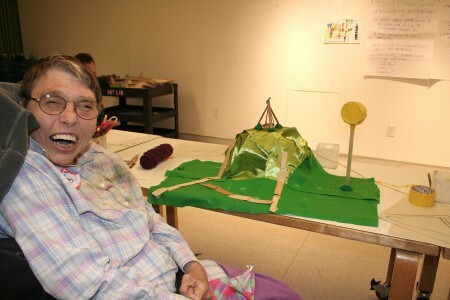 Merrie said, “Cargill was very open and light.” She also noted that the tight floor space in gallery 4 (Midnight Party) made her feel “kind of nervous” in her wheelchair. 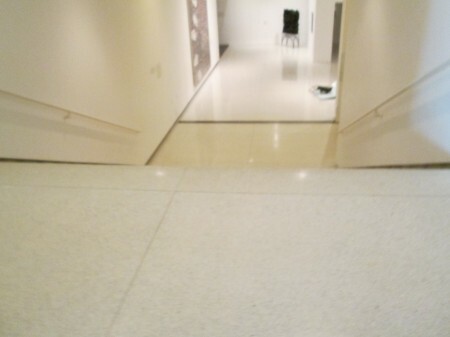 Richard took a picture of the terrazzo stairway outside the elevator of gallery 4 looking down to gallery 3. This made him uncomfortable, and he told us the story of someone in a wheelchair that had rolled down the stairs backwards. The slower pace and individualized attention received on this tour afforded PRI artist an opportunity to scrutinize and enjoy the artworks more intensely. Everyone commented on the smoky scent and heat felt in the Haegue Yang installation titled Series of Vulnerable Arrangement – The Blind Room in The Living Years. The design planning of the indoor spaces started with sketches again and resulted in models. 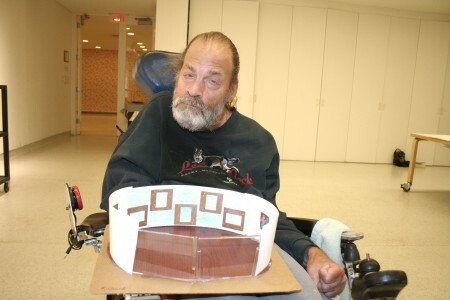 Richard’s designed his space on one level and specifically said that the walls would be curved. This large gallery would display an array of his two dimensional artworks. The PRI artists, based out of studios in Minneapolis and St. Louis Park are currently working on their final projects for Challenging Perspectives: Negotiating Spaces. Their projects will be celebrated and showcased in a PRI exhibition hosted by the Walker Art Center on March 21, 2013 in the Skyline Room.On a personal note, I’d say that PRI artists are direct and intuitive about art and they circumnavigate new spaces with determination and resilience. The artists’ spontaneous aesthetic choices delighted me, and I hope we’ll continue this partnership in the future.Richard and I worked together a number of times. On several occasions, I held his charcoal, and he held my wrist to direct my hand with the charcoal across the paper. The rhythm and pressure supplied to each gesture reminded me of a dance; I felt honored that he trusted me as his drawing partner. A grant from MRAC (Metropolitan Regional Arts Council) has supported Partnership Resources artists’ collaboration with Walker Art Center for 2 years in a row. In 2011, the artists toured 50/50 and in 2012, they toured This Will Have Been: Art, Love & Politics in the 1980’s.